King Ahab of Israel had married a pagan queen. When she tried to import pagan worship, the prophet Elijah challenged her. She sent murderous henchmen to dispatch the prophet. In this reading, Elijah is fleeing for his life. In earlier chapter, Paul has established that Gentiles and Jews are now to live together in harmony, which was God's long secret plan, now revealed in Christ. Today Paul ties practical advice about peaceful living to his doctrine about Christ and about the Holy Spirit. For believers tempted to abandon Jesus, John's gospel repeats and disposes of some objections to following Jesus: his modest human origins, his extraordinary claims about eternal life, his transcending of their inherited traditions. This passage prepares the congregation to hear today's gospel, John 6:41-51, which you should read in preparation, too. Elijah (pronounced ee LYE juh) is running for his life. While doing the work of God, he had angered queen Jezebel, who sent murderous henchmen after him. (She's the reason that the name "Jezebel" has such awful connotations. Read the whole fascinating story in 1 Kings, chapters 17-19; imagine Anthony Quinn playing Elijah in the movie). Elijah is frightened, tired, and resigned. The drama in this passage is over Elijah's choice between giving up and dying, or carrying on. Proclaiming the Passage: When you read the prophet's words, "This is enough, O Lord. Take my life...," let yourself sound resigned and despondent. State that he lay down and fell asleep, then pause for dramatic effect. This gives the listeners a chance to wonder, "What happens next? Does he just die? Will God intervene?" Tell the next part simply: An angel woke him, ordering him to eat. Elijah did so, but then he lies down, as if to die, again! Here again, pause and let the questions arise. Then, when you read the angel's words, "Get up and eat, else the journey will be too long for you," change your tone of voice to animated and hopeful. State the concluding sentence firmly, letting it resolve the dramatic tension. Sorely tempted, a worn out but courageous person chose to cooperate with God, and triumphed over himself. Much of the letter to the Ephesians is meant to help a diverse community of believers live in unity. 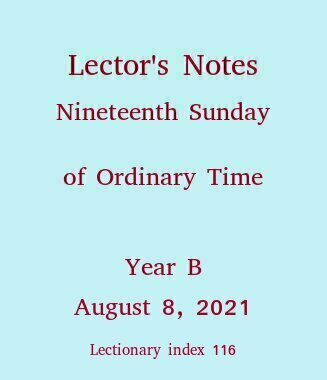 See Lector's Notes from four weeks ago, three weeks ago, and two weeks ago. In last Sunday's passage, Paul began a practical list of behaviors to avoid if the community is to be harmonious. Intervening sentences, skipped in the Lectionary, warn against lying, letting anger fester, stealing, and foul language. Today's passage sums it all up. What does it mean to be "sealed with the Holy Spirit for the day of redemption"? The expression reminds me of Exodus 12:1-14 where a visible mark on the dwellings of the chosen ones let them escape a plague visited on their surrounding enemies. And it reminds me of my contemporary version of Saul's Tents & Sails Company, where the guards admit us if we're wearing our ID badges, and detain us if we're not. Paul seems to envision the "day of redemption" as the final judgment at which God will redeem those marked with the seal of the Holy Spirit. Proclaiming It: Remember, this is a summary of verses your congregation has almost certainly not heard. It stands on its own, but you should read it slowly, lest it sound seriously out of context. In the past, I've heard lectors confuse "reviling" with "reveling." Even if you believe that to revel is a vice, it's not what's condemned here. The awkward translation "a sacrificial offering to God for a fragrant aroma" appears in the 1971 version thus: "He gave himself for us as an offering to God, a gift of pleasing fragrance." The imagery is of incense wafting heavenward. This is not to suggest you proclaim it differently from what is printed, but at least you'll know what it means. Elijah, by Philip Ratner (American, born 20th century), from the site of The Ratner Museum, Bethesda, Maryland, U.S.A. 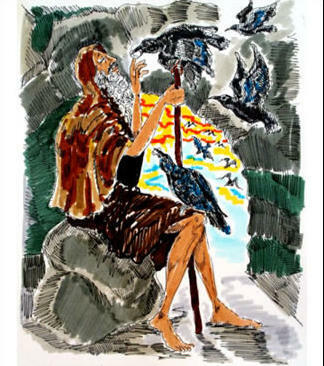 The painting depicts Elijah being fed by ravens. See 1 Kings 17:1-6.